This past year has been financially difficult for me and the family at times. Being a government employee is not the most secure job these days. So, with the many furloughs taking their toll on my bank account, I have not bought all that much in the way of new gaming material since the summer. Well, a very kind soul at Consim World graciously offered up a wargame to someone that was financially strapped so that they could have a little something new and shiny under the tree for the holidays. I contact this most generous individual and yesterday a wonderful looking game was delivered. 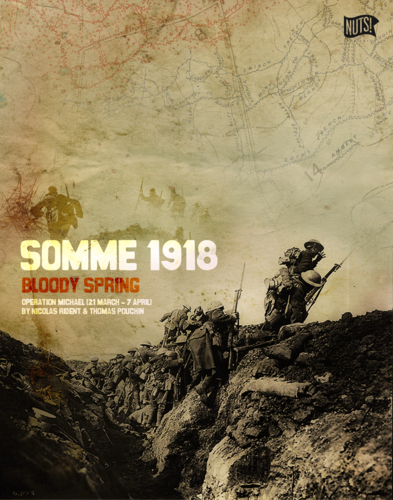 Somme 1918 by Nuts! Publishing. While I haven’t had a chance to read the rules yet, but oh, I will! The production value alone of the game is amazing! The box, smaller than standard US published wargames contains a boat load of paper and cardboard crack! The game components themselves (except map and counters) are high gloss and printed on heavy cardstock. I really like the set up charts for each of the scenarios. I think that is going to better facilitate game play. The map is a gorgeous piece of work that appears to be a combination of satellite imagery and artistic drawing; a nice balance of the two has been met in my oh so humble opinion. The counters are rather thick and feature tradition NATO symbols and represent the various ground and air units that participated in the battle. The rulebook is broken into basic (of sorts) and advanced rules and physically seperated into two booklets. This is quasi-reminiscent of the old Avalon Hill days and I can really appreciate this approach. The rules in the primary booklet are the crux of the game and related directly to the 3 scenarios that are included at the back of the booklet. The advanced rules add to the basic rules and will allow the play of the full campaign game and add things like random politcal events and other aspects of the game not already covered in the basic book. All in all I am very excited to give this a whirl. I enjoy reading and researching WWI so, this is looking like a nice addition to my collection. More importantly, I am super appreciative of the generousity of the gentleman that sent it to me. A debt I will repay in the future when my financial situation gets a little better. Previous Post So it Begins!